1. 22nd Street Station must be crazy in the peak periods. At least everyone has queued up in an orderly fashion from the bus stop pole. For the bus I was taking that day, the 340 Scottsdale, this line actually looped around itself, since it would be encroaching into the next stop in the loop. Such a line suggests to me that a bus is late. One bus arrived into the loop and pulled into the stop for the 340, but did not board passengers. That’s when another bus went in behind and opened its doors. The orderly queue broke up immediately as those at the back of the line poured into this bus, while the other passengers who were at the head of the line felt cheated. But wait, there’s more! I boarded the second bus, fine. But it did not leave with a full load. No standing passenger went up the steps to the rear of the bus. There was a big debate in the Buzzer Blog recently, and I concur with one of the commenters that it’s just the aversion of going up those steps. That must have been double frustration for those passengers at the front of the line, most of whom stuck around to wait to board the first bus. As I was already on a train by the time I saw it, I didn’t pursue it further, but replied back that I’ll monitor it next week if it happens again, or if tonight’s experience on the train was just an anomaly. I would never count on the schedules too much. At the end of the day they’re really all just estimates. When I saw the line for the 340, which crosses two major bridges between Scottsdale and 22nd Street Station, I knew not to assume scheduled times during PM peak. 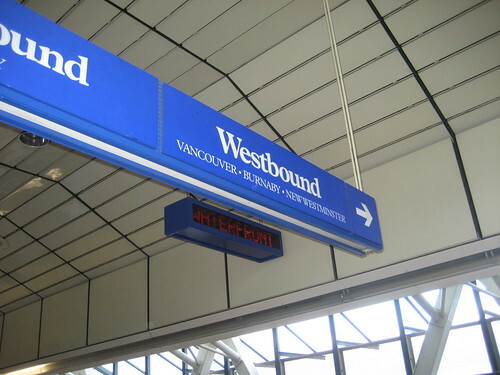 SkyTrain should have been eight minutes, based on past experience. I don’t see any reason why it shouldn’t been the same last night.